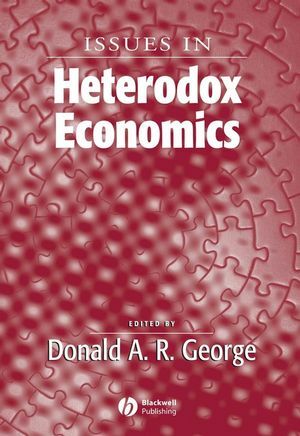 Through contributions from leading authors, Issues in Heterodox Economics provides a critical analysis of the methodology of mainstream economics. Donald A.R. George is Senior Lecturer in Economics at the University of Edinburgh. He has been a Jean Monnet Fellow at the European University Institute in Florence, Italy, Visiting Associate Professor of Economics at Queen's University, Canada, and Visiting Professor of Economics at the University of Canterbury, New Zealand. He has published extensively on the economics of self-management, economic dynamics, and the economics of product reliability, and is joint founding editor of the Journal of Economic Surveys. 1. Consolations For The Economist: The Future Of Economic Orthodoxy: Donald A.R. George. 2. Axiomatization And Formalism In Economics: T.A. Boylan and P.F. O'Gorman. 3. Variety Of Methodological Approach In Economics: Sheila C. Dow. 4. Variations On The Theme Of Conning In Mathematical Economics: K. Vela Velupillai. 5. The Sociological Approach To Financial Markets: Alex Preda. 6. Workers' Savings And The Right To Manage: Donald A.R. George. 7. A New Vision Of The Knowledge Economy: Brian Chi-ang Lin. 8. Evolutionary And New Growth Theories. Are They Converging? : Fulvio Castellacci. 9. Repetition And Financial Incentives In Economics Experiments: Jinkwon Lee.